As bloggers, we know that content is key. We write for ourselves and for our audience, and we take pride in what we write. We all have posts of which we are proud; posts that may have required research or more intense effort and thinking to bring to publication. And we all make mistakes. Sometimes, we read it over so many times that our eyes water We miss errors because our brain knows what we want to say, and, as a result, our eyes may not recognize the mistake. 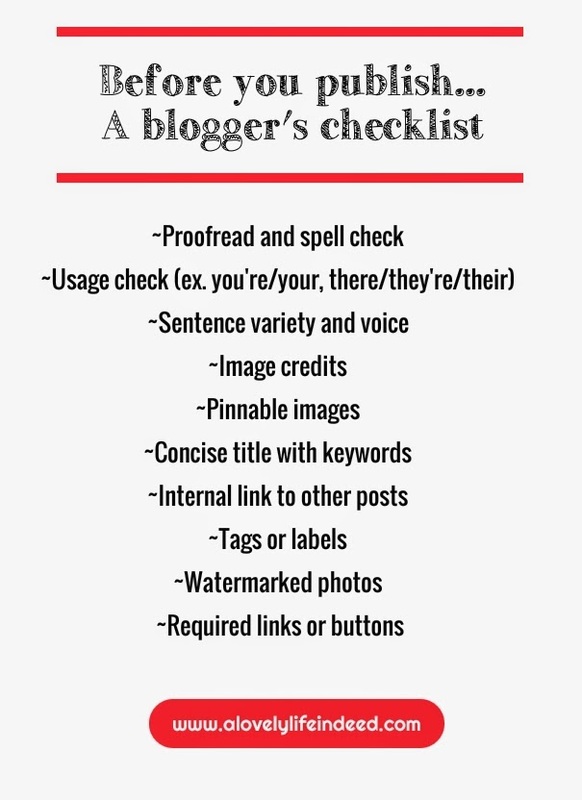 It's nice to have a checklist of things we should do before we publish. True, we can go back and edit, and many of us do. But I am a list person, and a to-do list helps me stay focused and more efficient. Here is an example of one I might use. It goes without saying that we must proofread for spelling, grammar and usage. Proofreading is important because a word may be spelled correctly, but if it is used wrong, it's wrong. Grammar issues, such as active/passive voice, verb tense and agreement, and parallel structure are important. Not everyone will notice errors, but you never know who the grammar geek will be, and if it is someone who works with a brand you are courting, you may lose out on a preferred account. Whenever possible, cite your sources, including where you cull you images. You may choose to watermark your own original images. In a world where images can be lifted easily, watermarking makes sense. It's your call. For better or for worse, long form journalism is out; lists and top 10s are in. Keep your message concise and present it in a way that is palatable to today's reader. Include at least one pinnable image in every post. Keep your title concise and include a keyword from your post. Consider internal links to other posts you have written that may relate. Tags and labels help your reader find other posts in similar topics. You may organize your posts by such tags and labels and display them in your sidebar. Joining a link party? Most of these parties require that you display a button or link to the party post. Make sure you include this piece or your post may be removed from the event. Are there other things that you consider before you post? Please share your own best practices in the comments below. More bloggers need to think about things like this! Pinning! Great checklist! I always forget to watermark my images :( Pinned! Good list Kelly! I always consider flow as well. I saved this to use as my daily checklist. Great list. Proofreading is key, but a few slip out here and there. Linking to past posts is something I am working on. Everyone makes mistakes. Sometimes our brain knows what we're trying to say, so our eyes don't see it. Great, Kristy. :-) Thanks so much for stopping by. Thanks, Steph. Flow is so important. It's in our voice, our word choice and our sentence variety. It's so important and improves over time. LOL, Rebecca. Maybe you've been blessed by the grammar gods. Thanks, Carolann. I have to do a tutorial, because I still don't know how. Thanks for pinning! Thank you so much! Blogging keeps getting more and more layered. Every day is a new learning experience. Congratulations on you blog, Clara. I agree with you. On one hand, it's a shame to see long format disappear, but then again, I would never finish with all of my favorite blogs. There has to be a balance.